360 hp, 90 rpm; 20 x 24" cylinder; Firebox boiler 8 x 15.6, 90# by Desotelle and Hutton, Detroit. 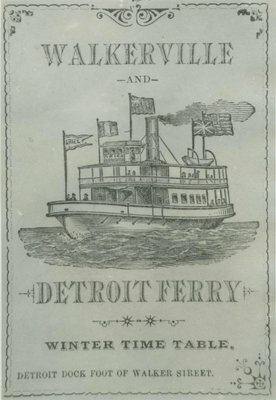 1881, Dec 17 Enrolled Detroit; ran Joseph Campan Street to Walkerville until 1922. 1902 New Scotch boiler 11 x 11, Desmer & Ritchie, Detroit, MI. 1922 State of Michigan Highway Department; used across Straits of Mackinac. 1926 Rebuilt; second deck built forward 95'9" x 28"9" x 11'1"; 68 gross/86 net tons. 1936 State Bridge Commission, employed Port Huron, laid up on completion of Blue Water Bridge. 1938-1944 Laid up Port Huron. 1944 Dubois St., Detroit, MI. 1947, Dec Capsized by wind; dismantled.